Each day for the month of August, a new message will apear on billboards over four major highways in New York, San Francisco, Chicago and Boston. 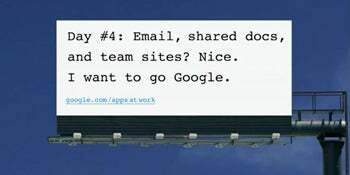 Simultaneously, the company is encouraging a word of mouth campaign with a “Spread the Word” site that lets users download pro-Google posters that they can print out and post around their offices. The search giant is also encouraging users to tweet about their interaction with Apps by using the hashtag #gonegoogle. Google introduced its enterprise app solutions in 2007, and while many individuals have started using the service since then, many corporations have been hesitant to make the switch to free applications online. Google’s new campaign is interesting because it both leverages existing users and reaches out to people who use the competition’s products where they are, presumably not online. It’s an interesting return to low-fi advertising at a time when the economy is struggling. As Ian Schafer pointed out today, the simplistic design of the ads actually bears a striking resemblance to a previous billboard campaign that mentions Microsoft. The ads, featuring such bon mots as “Recession 101: Bill Gates started Microsoft in a recession,” were sponsored by the Outdoor Advertising Association of America and attempt to put a positive spin on the recession. But Microsoft isn’t sitting back as Google tries to eat away at its dominance in the applications business. The company has added web functionality to its offerings and has been quick to reiterate some of the reliability and functionality issues that plague Google’s cloud only offerings. In addition, they are set to rollout a free web version of Office in early 2010. Microsoft currently supports some cloud functionality on Office now, but when those features are more fully expanded, it will be interesting to see how heated this ad battle gets. selling a product, not a solution. 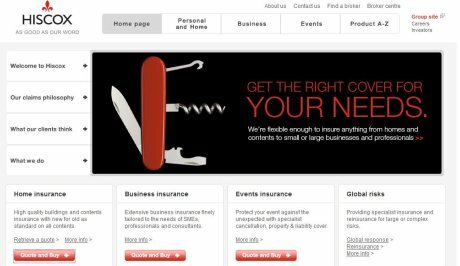 Insurance firm Hiscox relaunched its UK website at the beginning of the month, with the aim of simplifying the company’s online offering. Conde Nast has identity problems online. The publishing house announced on Monday that its online male fashion coverage would be folded into the websites for magazine properties GQ and Details. I wrote about the decision here.